What is your entryway saying about you? Mirrors are great to use in a foyer. Not only do they provide a chance to look yourself over before greeting your guest, but they also help bounce light and add depth. Another nice element to have is a lamp. A lamp’s soft lighting gives a welcoming glow and makes the space feel inviting. We at 3A are big into adding a bit of greenery to our designs. Greenery brings life to a space and also adds color and texture. In the grouping we put together for you below, the chest of drawers is great for storing keys, mail, and dog leashes; anything that you need to access easily before walking out the door. If you use a console without any drawers, small tabletop baskets or bowls work great too. If you love the look of the foyer grouping below, click on the links to re-create it in your home. Here are a couple more entryways we put together recently for two of our Ask My Designer clients. If you need more ideas on creating an entrance space within a small footprint check out this blog post we did on small entrances or let us help you with our affordable Ask My Designer service. We recently completed an Ask My Designer project for a condo refresh, and it was so fun to breathe new life into the clients' space with a few easy updates. The most labor intensive idea was adding some grid trim work detail down the hallway. Aside from that, all of the updates were a few new purchases and such game changers in updating the look of the condo. The owners wanted a relaxed, transitional design and had already purchased a few new items but were lost on how to tie up all of the rooms. They also wanted a fun idea for their existing bunk room. With the Ask My Designer service, they were able to get a few things sourced for each room without having to do an entire E-Design for each space. This service is great for those who have already started their projects or just want some help finding those missing pieces! The living room got a new jute rug, coffee table, throw pillows and some fun black oars to hang as artwork over the long wall on which their sofa resides. As previously mentioned, the main hallway was not forgotten! 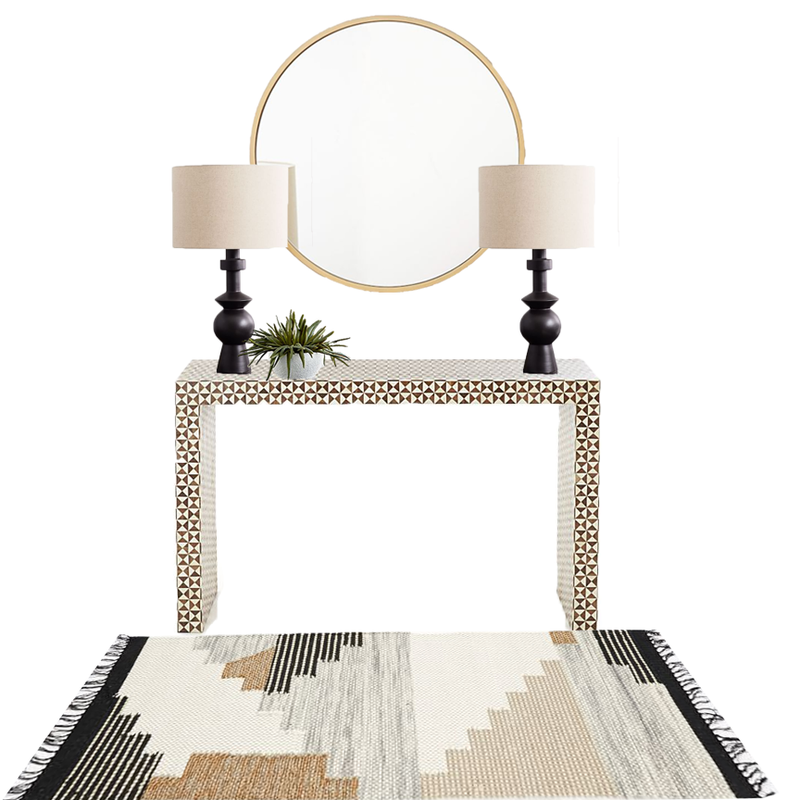 Simple grid trim work, some cool sconces and a striped runner (on sale!) completed the previously overlooked space. All the master bedroom needed was some new bedding, lamps and accent over the dresser. The geometric pillows and simple mirror helped finish off this relaxed, contemporary space. In the twin bedroom, we sourced new headboards, a side table, lamps and bedding and also suggested updating the room's current window treatments with these bamboo shades. Perhaps our favorite room in the condo is this bunk room. White built-in beds with a natural wood ladder and some playful lighting and bedding make this room quite the spot! We loved helping this family make their home away from home somewhere they'd be proud to call their own. If we can help you finish off a room or two, simply fill out the survey on our Ask My Designer page. All of the information is explained there, but if you have any questions, please don't hesitate to ask!